Update: I've released Scythebill 12.7.1, with two small fixes. The new BirdLasser import failed for some date formats; it now should reliably import. Also, location detection would sometimes fail to detect the state/province of a location (only finding the country); it should now be more reliable. Original note: Scythebill 12.7 is here! As always, download here, and let me know if you have any problems, either on Google+, Facebook, or by email. When you were entering a new location, Scythebill previously would first show you a latitude and longitude from a Google service. If you wanted to get information from eBird, you had to click another button ("Ignore Google result?") to get to it. Now Scythebill will load from both simultaneously, so it's much easier to get to eBird results. Also, once you have a latitude and longitude entered, Scythebill will show you a new Search nearby button. This will look for eBird and Google results near that location. This makes it much easier to pick eBird hotspots. 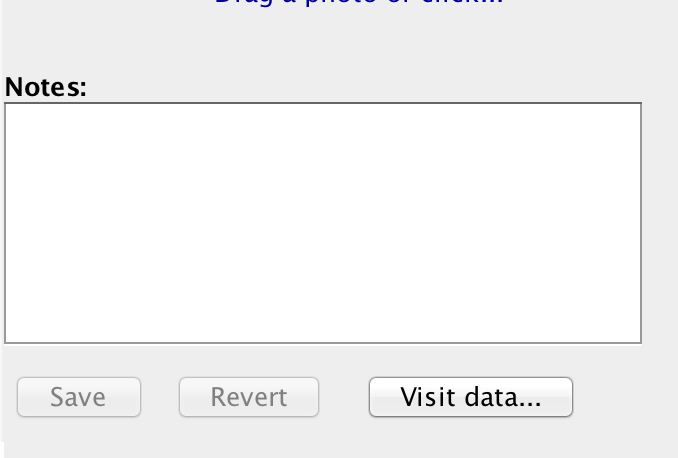 Click that button, and you'll get a dialog where you can see (and edit) the visit data for that visit. Scythebill now has explicit "domestic" forms of Mallard, Greylag Goose, Swan Goose, Muscovy Duck, Helmeted Guineafowl, Indian Peafowl, Red Junglefowl (aka "Chicken"), Wild Turkey, Budgerigar, African ("Ringed") Turtle Dove, and Cockatiel, as well as a feral form of Muscovy Duck (for the fully wild Florida population that is derived from domestic birds). Domestic forms are never countable - they're used for those flocks of domestic ducks (and others) that might have some wild genes remaining, but are genetically not the same as wild individuals, even if they are established, breeding populations. They are, nonetheless, very much part of the eBird taxonomy, and this will make it much easier to export to (and import from) eBird when you've recorded these individuals. You can store domestic sightings of any other species as well, with the new Domestic sighting status option. Scythebill now supports imports from BirdLasser, an Android and iOS app for recording South African bird sightings. This support is somewhat experimental, as BirdLasser has a very different location model (latitude/longitude for each sighting) from Scythebill; Scythebill will do what it can to automatically find nearby locations using eBird and Google. Let me know how this works if you can try it! 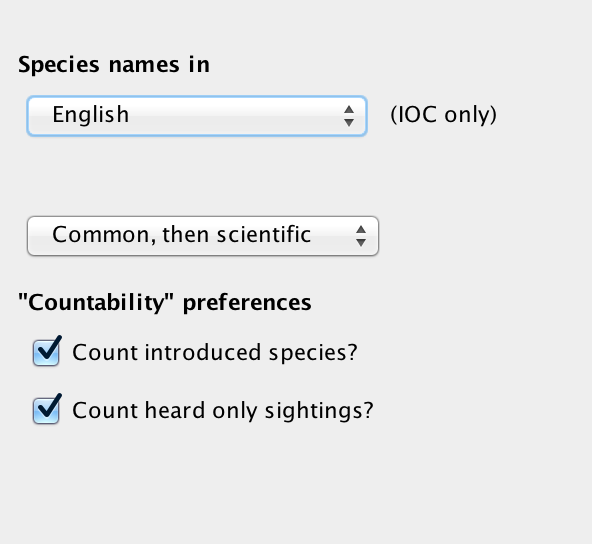 Some eBird checklists wouldn't import (as they had a hitherto-unknown-to-me date format); that's now fixed. Avisys exports now proceed smoothly even when most of the rightmost columns have been removed. There's a new Backup now... button on the preferences page, if you want to force an immediate backup after lots of data entry. The "Complete list of sightings?" checkbox was far too easy to overlook when entering sightings. 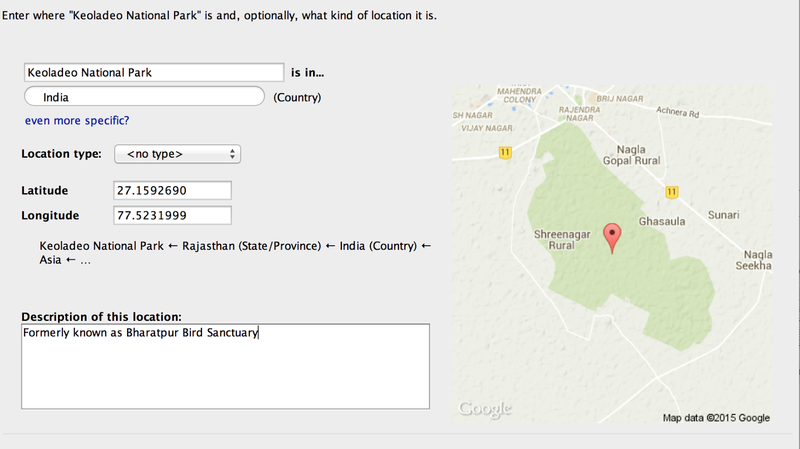 I've added another place to select that option on the prior page, where the rest of the visit information is entered. Scythebill now allows you to enter "Dead" as a sighting status, for those unfortunate occasions when you record a deceased bird. Such sightings will never be counted as lifers or any other species totals, but will be included in eBird exports. Finally, there's a new Location description field in Scythebill CSV exports and imports. This time around, there's a number of small improvements to the checklists of the Azores, France, Sulawesi, Mauritania, Morocco, Uruguay, Ecuador, Colombia, Mexico, and New Zealand, as well as a number of first country records from the Western Palearctic and first provincial records from Canada. The built-in state checklists for Indonesian states will now be available even if you've rearranged the built-in locations a bit (moving Indonesia to an "Oriental Region" or something similar). Bulk date editing would fail if you only entered a partial date (e.g. changing the year of a large number of records). That's fixed. 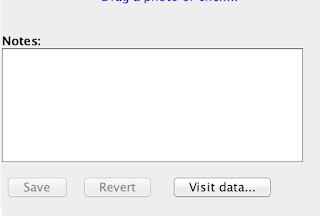 If you dragged photos into Scythebill on MacOS, those photos might fail to display when later clicked-on. That's fixed too. A couple of uncommon (and harmless but annoying) cases where error dialogs would appear have been fixed. Scythebill 12.6 is here! As always, download here, and let me know if you have any problems, either on Google+, Facebook, or by email. You can view species range maps with a single click. Correcting the dates and locations of your visits is now much easier. States now list their endemics - and multi-state generation has improved to go along with it. There's new checklists for each of the seven main Indonesian regions, and one for the Åland Islands. Some long-necessary cleanup for the Scythebill state and province lists has completed, most noticeably changing Ireland, the Philippines, and Sudan. The new IOC 5.4 taxonomy is available, and Scythebill already supports it! Taxonomic highlights include a swarm of kingfisher splits and a three-way Paradise Flycatcher split, but you can see the full list of changes on the IOC website. Scythebill now lets you view species range maps at a click. 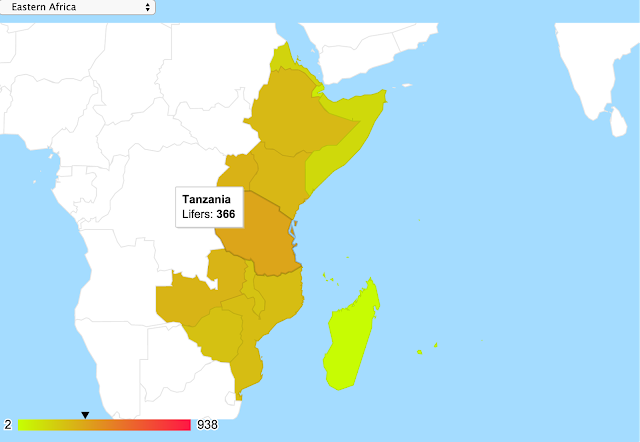 When you see the word Range underlined - either entering species, or in Browse by taxon, click, and you'll get a map like this one, which not only show you the world range, country by country, but also let you zoom into regions of the world, and even the per-state maps in the United States, Canada, and Australia. (Look for the menu at the top-left of the map.) These maps are limited - they only show distribution at the country (and sometimes state) level - but they do provide a very quick way to get a feel for a bird's range (and, sometimes, to spot mistakes in the Scythebill checklists). When you select a single visit in Browse by location, you can now change the date and location of that visit right from that page without leaving it. There's a new Save a copy as... menu item in the File menu, which will save a second copy of the Scythebill ".bsxm" file (especially useful for moving your list to a second machine or manually backing up). Hopefully, this will make it a little clearer to users that "
Scythebill has long identified the per-country endemics, but it now also identifies bird species that are globally endemic to a single state, like Yellow-billed Magpie in California or Rockwarbler in New South Wales, etc. And the trivial multi-state-or-country checklist generation added in Scythebill 12.5 goes along for the ride. So you can now even generate a checklist combining - for example - California and Mexico - and see the global endemics shared between them! 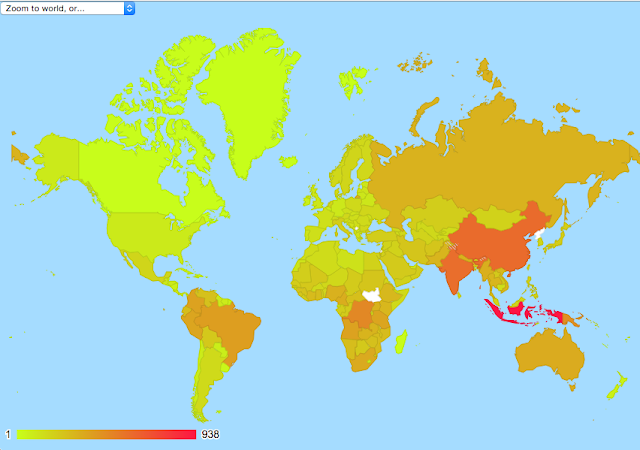 Geolocation was also slightly tweaked so that Google-identified locations now will map to these regions. There's also a new checklist for the Åland Islands. I've done a lot of cleanup for the US state checklists. The range of Caspian Gull had not followed taxonomic changes - it's now a monotypic form, with "barabensis" moved to Lesser Black-backed Gull, and "mongolicus" moved to Vega Gull (Herring Gull in eBird/Clements). It's now changed accordingly - I'd recommend checking your records! Abdel B. contributed some improvements for Tunisia and Hong Kong. Scythebill tries to hold to the eBird location organization. (It's fairly close to the standard ISO-3166 arrangement, for those who care about such details.) But it's missed some of the changes made in the last few years. In most cases, these were trivial (some simple name changes), but there were a few major issues that would have made eBird importing difficult. eBird no longer uses the 26 counties of Ireland as "states", instead using the 4 Irish provinces. Scythebill now puts all of the above in its proper place, automatically. Scythebill still had the out-of-date Sudanese states prior to the split-off of South Sudan. Those who bravely bird this part of the world will be happy that Scythebill automatically moves sightings from the old Sudanese provinces into South Sudan where necessary. eBird (and now Scythebill) use the 82 provinces of the Philippines instead of the 15 regions. Scythebill had the wrong codes for the Yukon Territory of Canada and Maluku province of Indonesia, which would have made importing into eBird unnecessarily difficult. BirdBase imports now correctly import species counts. 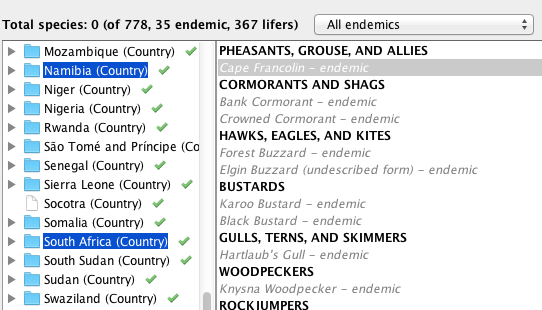 eBird "life list" CSV files with accented characters will now be correctly imported. Scythebill 12.5 - backups, multi-country checklists, and more! Update (Sept. 22): I've released Scythebill 12.5.1, mostly to fix a bug when entering sightings for a new location. Thanks to Robert M. for the report! In addition, this version has further improvements for importing from Observado.org and Waarnemingen.be/.nl. Scythebill now supports automatic weekly or monthly backups of your sightings. Scythebill can trivially generate checklists for multiple countries together. Observado.org and Birdbase importing is improved. Clicking on maps makes it easy to tweak latitude and longitude. Data entry is even faster! A note, perhaps on the negative side for some. With this release, I've stopped including the "Snow Leopard" version for MacOS. MacOS Snow Leopard was last updated 4 years ago, and hasn't been getting security updates for almost two years. The Snow Leopard version of Scythebill has been getting very few downloads, and at least some of those appear to be accidental. This isn't an irrevocable decision, so if there's some of you out there who depend on the Snow Leopard version, please let me know. The preferences page now has a new option - you can choose whether you'd like weekly or monthly backups, and where you'd like those backups stored! I strongly recommend that users choose a backup directory using a cloud provider like DropBox or Google Drive. These services are free and will keep your data safe (and secure); storing your backups on your local drive will not help you if your disk crashes or something worse happens. Did you know that Africa has 1,606 endemics, and South America (only 60% as big) has an amazing 2,383 endemics? I didn't before, but now it's easy to find out. Here's an old feature you may not know about: just after clicking "Add species" when entering sightings, try typing a number. The cursor will immediately jump to the Number field for that species, and you can enter a count; hit Enter, and you'll jump right back to the species name field. I'd still describe the support here as beta-level; in particular, Observado.org seems to be a work-in-progress with changing values (the meaning of the "simple CSV" checkbox changed in the last week), but it's definitely useable now. Please let me know if you have any suggestions for improvements or find any problems! Finally, Scythebill-style imports got an important bugfix. For the last couple of releases, imports failed if they didn't have a "Location 1" column - it could be an empty column, but it had to be there. That's a bug, which is now fixed. Scythebill has been able to automatically find the latitude and longitude of your birding spots using Google and eBird since Scythebill 12.0. But when that feature wasn't quite right, with the selected highlight not exactly where you meant, there wasn't an easy way to fix it. Now, clicking anywhere the map will update the latitude/longitude, and there's a new Zoom In button (a plus sign) to let you fine-tune that location, and a Zoom Out button (a minus sign) to double-check the location for relatively featureless parts of the world. I've cleaned up the Australian state checklists to the extent possible with online resources (Victoria and Northern Territory are still a bit sketchy, as I could not find official checklists). On the other hand, I have entirely removed all of the checklists for the counties of the United Kingdom and Ireland. These checklists contained many errors, and I saw no straightforward way to clean them up with available resources. My apologies to anyone who found these useful; I'd rather limit the officially supported checklists to those whose accuracy I can vouch for. Speaking of custom checklists - earlier versions refused to update custom checklists that had been saved with an old taxonomy. Now, they'll get upgraded automatically when they're opened. East Asian corrections, courtesy of Yann M.
Southern African corrections, courtesy of Niall P.
In "Browse by location", when you've selected a single visit, there's a new "Edit species..." button. Clicking that will take you right into the "Enter sightings" flow for that visit to the full list of species, so you quickly edit what you saw. eBird exports now include the start time in the default name, which makes it easier if you're visiting the same site multiple times in a day. In "Browse by location", Scythebill will now tell you how many of a country (or multiple country) endemics you've seen. The total count of families in "Show reports" did not pay attention to "Count heard only?" or "Count introduced?" preferences. The "choose-your-own-abbreviation" feature had problems with apostrophes. For example, "blyths" should have matched all the names starting with "Blyth's", but only matched "Blyth's Swift" and "Blyth's Shrike-Babbler". That's fixed. Nearly all of these smaller improvements (and some of the bigger ones) came from ideas that started with users. Thank you, and keep those ideas coming! Scythebill 12.4 - BirdBase imports and the new eBird/Clements taxonomy! You can import directly from BirdBase exports! Scythebill 12.4 includes the just released eBird/Clements 2015 taxonomy, with a mass of splits, like a 3-way split of Asian Paradise-Flycatcher, a 6-way split of Purple Swamphen, and a 15-way split of Variable Dwarf-Kingfisher! There's also a few new undescribed forms, like "New Caledonian" Storm Petrel, "Bananal" Spinetail, and "Elgin" Buzzard. I've updated all the checklists to account for these splits, but I'd caution that some of the work here is necessarily tentative. There is fairly little reliable information on some of these splits - if anyone reading this has solid data on the distribution of buzzards in southeast Asia, I'd certainly love to hear it! All users - whether they use the eBird/Clements checklist or the IOC checklist - may have a bit of work to do when they upgrade. Scythebill does all it can, using the subspecies you've entered and its checklists, to minimize the work, and the process is described in detail here in the manual. And you can always punt that work to later if there's splits you're not ready to resolve. BirdBase recently closed its doors after literally decades of supporting the birding community. For all those users, Scythebill now supports directly importing BirdBase CSV exports! Just visit the Import screen, click the new Import from Birdbase... button, and open up a BirdBase export, and Scythebill will have all your data imported in a flash. The "S1" through "S4" custom flags will, when set, be added to your sighting notes. You can use Show reports to find all notes containing those strings and then bulk edit to set a Scythebill field like "Heard only". Scythebill will add one of "BirdBase Home", "BirdBase Region", or "BirdBase Local" locations when those BirdBase flags are set. BirdBase did not include a complete and modern set of countries, so a few liberties have been taken (all "Yugoslavia" sightings are placed in Serbia; all Leeward Islands sightings end up in Montserrat; and so forth). As always, after you import, I'd recommend visiting "Verify against checklists..." to look for issues revealed during the import (in particular, any mistakes Scythebill made assigning sightings to species - it's generally pretty darn good, but not perfect). And if you have any problems with BirdBase imports, please let me know. I'm more than happy to personally import your file to Scythebill so I can fix any problems that lurk in this new feature. I also think that I've improved Avisys imports - I suspect that locations will import more cleanly, and that files that did not import well (and took a long time to even report failure) will now import more cleanly. The last version of Scythebill added preferences to control what you consider a lifer - skipping introduced or heard-only birds. But I missed several places in Scythebill where lifers are enumerated or listed (for example, in the "only lifers" view of a checklist). These should all be working as expected now. The Canary Islands were a bit confused in Scythebill - available both in the Atlantic Ocean and as the Canarias province in Spain. There's now just a single Canary Islands location, in the Atlantic Ocean (and the country code is fixed, so importing to eBird will work). There's also the usual set of checklist improvements, though this time it's only a few dozen fixes. As always, thanks to the users reporting problems. The Browse by location screen would sometimes show "introduced" twice on a single line. That's fixed. Printing was failing for Firefox users; this should now work. Geographic cleanup of offshore islands for many countries, with a lot more "magic" locations to track full country lists. Lots more checklist corrections and new checklists - all of the Americas are done! What species in a US state would be new for an ABA list? What rarities of the Canary Islands would be new for your Western Palearctic list? What Australian birds would be new for your year list? All these questions are easy to answer now! Find the checklist you want to examine. In the window, choose the report for which you'd like to find new species. So if you wanted to find checklist entries that would be new for the Western Palearctic, choose "Location" "is in" "Western Palearctic", and click OK.
That's it! You'll now have a list of species that would be new for that report. If you'd like to exclude rarities, just check the new Hide rarities? option. Thanks to Jochen B. for the feature idea. The Colombian department of "San Andrés, Providencia, and Santa Catalina" has been moved to the West Indies. South Africa's "Prince Edward and Marion Islands" have their own entry in the Indian Ocean. The Netherlands Antilles have been divided in two. The West Indies portion comprises Sint Maarten, Sint Eustatius, and Saba. The South American portion includes Bonaire and Curaçao. (Aruba left the Netherlands Antilles in 1986, and is its own country in the Kingdom of the Netherlands). Spain's "exclaves" of Ceuta and Melilla have been moved moved into Africa. You can find the full definition of each of these in the online manual. There's additional, smaller fixes in southern Africa, the Indian Ocean, Costa Rica, and Peru. I've fixed a couple of problems with the photos code added in the last release. If a photo was moved or deleted, and Scythebill couldn't find it, you'd get an unfriendly error message. Now, you can relocate the photo and fix the problem. Under some circumstances, Scythebill might not save added photos. Scythebill 12.0 - better locations! 24 newly reconciled checklists - the United States and West Indies are (almost) done! Here's Keoladeo National Park in India - Scythebill (or, rather, Google) found it and automatically placed it inside Rajasthan State. Latitudes and longitudes are now part of the Scythebill import and export format, and will also be grabbed out of eBird imports. The last of the states in the United States is done! Kentucky was cleaned up by Bill D., and the wonderfully helpful Zack W. took care of Maine, Maryland, Hawaii, Florida, and the District of Colombia! Abdel B. contributed a number of corrections - mostly southeast Asia, but also some African fixes too. Scythebill now offers some experimental support for importing from observado.org files - which also supports waarneming.nl and waarneming.be. Do let me know if you have a chance to try this out! The "Domestic Form" of Rock Pigeon now imports cleanly into eBird. Reports now show a family count next to the species count. Thanks to Eric S. for the idea! If you use the arrow keys to navigate while entering species, a few species of context at the top and bottom always stay visible - again, thanks to Eric S. for the suggestion. You can now edit the "Complete list of sightings?" setting for a visit after initial entry. An error message that could appear when creating a new .bsxm file - especially for first time users - has been fixed. If you clicked the "Back" button while entering sightings, you lost all your work and had to re-enter everything. (Ugh.) It's been fixed.